Time for more horror with Fuura-sensei, which I could generally do without, however it kind of works on a meta-level this week. See, this episode is about Kaos learning how to draw backgrounds, and that’s a terrifying subject for most newbie comic artists, so it’s only fitting that she has to do it in an attic, literally surrounded by skeletons, dripping candles and creepy dolls. It’s a clever bit of juxtaposition that might not be immediately obvious, but I’m pretty sure it’s intentional. Kaos seems to pick up background-drawing rather quickly though, while I still struggle with it, which makes me wonder; would I allow Fuura-sensei to tutor me, even if it means I have to be subjected to her horror shtick for an hour or so? I don’t know if even I love comics enough to go through with that…. 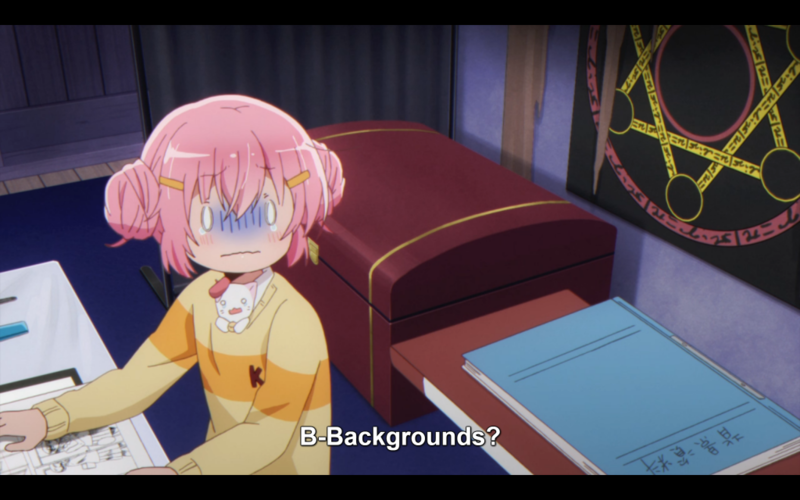 This is about my reaction when I realize that I have to draw backgrounds. I have this weird mental block with linear perspective, where I never seem to do it right no matter how many times I read about it or have it explained to me. It’s actually pretty sad. The best part of this episode is when Fuura-sensei shows Ruki a panel that Kaos drew, and Ruki doesn’t believe it because everyone knows that Kaos can’t draw well, then realizes how cruel it is to say that out loud in front of Kaos. It’s funny to me that “Kaos can’t draw” is basically a house rule that everyone acknowledges in a dorm specifically intended for artists. I would say “Git Gud, Kaos,” except now that she can draw bg, she’s technically better than me, so I’ll shut up. The other significant thing in this episode is the revelation that Koyume got a magazine serialization, so she’s jumped ahead of Kaos in terms of professional credits. She says it’s a short serialization, so she’s not quite on Ruki and Tsubasa’s level yet, but she’s getting there. I wonder: did she ever learn how to draw guys? I feel like she must have, and I feel kind of robbed that we never got to see that. 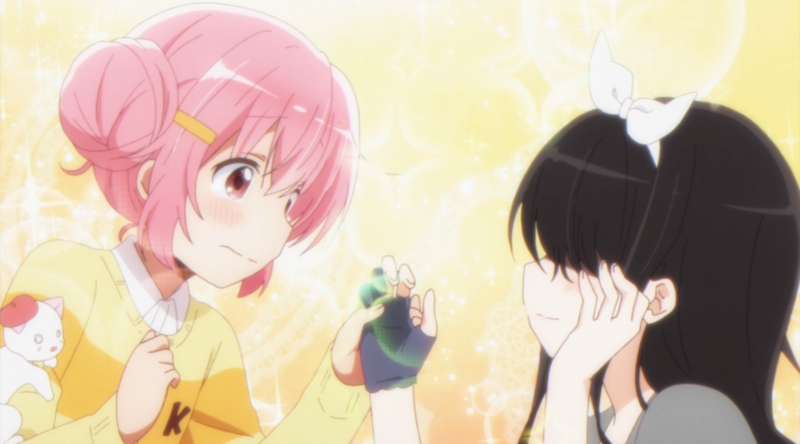 No major improvements off-camera, Comic Girls! Hopefully the next episode will have a little more substance, because they were on a roll there for a little while.